M2 Money Supply has just hit its highest level (M/M annualized increase, seasonally adjusted) since the post September 11th, 2001 period. The Federal Reserve is increasing liquidity as a cushion to offset upcoming rate hikes. 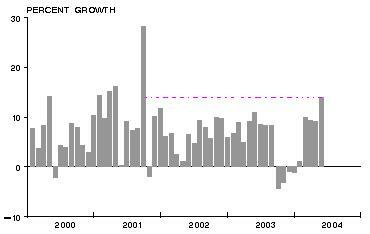 Inflation fears led M2 growth to slow Q4 2003 and early 2004. Liquidity increased in February, March and April ~10% (month over month annualized) before spiking in May to the highest levels since the post 9/11 period. In addition to the usual gyrations, Money Supply seems to spike every 4 years -- just before the Presidential elections; Call it a perk of incumbency . . .
What Should President Bush Learn from President Reagan?